KUALA LUMPUR: Property developer Jaya Upaya Corp Sdn Bhd expects to sell all its boutique bungalows at Milano@Kemuning by the end of this month after receiving overwhelming response during the project’s launch on March 6. Managing director Lee Cheng Bing told StarBiz the company had already sold 50% of the 38 three-storey boutique bungalows. “We are optimistic based on the feedback we received during the property’s launch where we managed to attract about 300 walk-in potential buyers and investors. “With the economy heading for improvement and attractive interest rates from the banks, we should be able to sell all the remaining units by end of this month,” he said. Lee said the bungalows were priced at RM1.5mil to RM2.3mil for lot sizes ranging from 4,000 to 7,500 sq ft. The project is located near the Kesas Highway. “A new highway is under development now to connect Kota Kemuning to Shah Alam. “Milano@Kemuning will be much more accessible once the highway is opened,” he said. He said the outlook for the property market was improving with most big developers upgrading their developments to come up with more premium products. “We can see in the areas surrounding Milano@Kemuning that people are still coming to buy properties from the developers though the prices have increased now. “Our launch that day saw the participation of some buyers in their mid-30s and this is a good sign that more young professional buyers are coming into the market,” he said. Milano@Kemuning is a gated residential scheme on 3.2ha of freehold land next to Alam Impian township and near Kota Kemuning in Shah Alam. The project has a gross development value of RM80mil and targets completion by the end of 2011. KUCHING: Naim Holdings Bhd will launch four new residential projects, comprising some 1,000 units with a combined gross development value (GDV) of RM360mil, in Miri and Kuching over the next two years. Senior director for property Radzali Alision said the projects planned were in Naim’s flagship satellite township – Bandar Baru Permyjaya – in Miri, Desa Ilmu and The Riveria in Samarahan near here. “Eighteen new designs will be introduced. 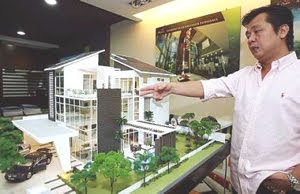 “House buyers always look for something new, and they do not mind paying 10% to 20% more for better designs and higher quality building materials,” he told StarBiz. The new launches will include about 140 apartments in The Riveria that will offer a commanding view of Sungai Kuap and Sungai Merdang. Radzali said construction work for the RM60mil Permy Mall in Bandar Baru Permyjaya was expected to start in two months. Scheduled to be operational in the third quarter of 2011, the mall will have a hypermarket, 160 shops and a food court. Naim will own and operate the mall, and lease the shops. Naim is Sarawak’s largest property developer, having built 12,500 houses in Bandar Baru Permyjaya, 800 homes in The Riveria township and 4,000 homes in Desa Ilmu in the past 10 years. Radzali said about 98% of Naim’s launched residential schemes had been taken up with houses priced below RM300,000 selling well. Last year, Naim sold 560 houses worth RM160mil compared with 630 units worth RM165mil in 2008. Radzali said Naim was the first developer in Sarawak to introduce 24-month warranty for houses last July and this had helped boost sales. “This year, we aim to sell some 800 units. Our focus is still affordable houses for the mass market,” he added. Naim has a total undeveloped landbank of over 1,000ha with estimated GDV of between RM5bil and RM6bil, including 400ha in Desa Labang in Bintulu. Radzali said the proposed mixed development – housing and commercial – for Desa Labang was now on the drawing board. “We have identified several parcels of land in high growth areas in Kuching, Sibu, Kota Kinabalu (Sabah) and Peninsular Malaysia for possible mixed developments,” he added. On the outlook for the Sarawak’s propety market, Radzali said most developers had reported good take-up rates for the new launches of their residential schemes. Talam Corp, a Malaysian property developer, said it signed an agreement to repay debts of RM241.4 million owing to the Selangor state government. Talam will sell its properties to help settle the debts, the company said in a statement today. The shares of Talam jumped the most in more than four months after the agreement. The stock surged 17 per cent to 13.5 sen at 2:36 pm local time in Kuala Lumpur trading, set for the steepest gain since November 2. PROPERTY developer Asian Retail Mall Fund II (ARMF II) will open a RM180 million shopping mall in SS2, Petaling Jaya in the third quarter of this year. Named SSTWO Mall, ARMF II has appointed DTZ Nawawi Tie Leung Sdn Bhd as the mall’s exclusive leasing agent and centre management team. It has a nett lettable area of almost 470,000 sq ft and houses some 200 shops.